These lucky fans managed to snap a pic with Rob yesterday when he and FKA Twigs went to see Dr Faustus starring Kit Harrington at the Duke of York’s Theatre in the West End. "The pic is kinda grainy coz I had to edit it a little to make it brighter coz the theater was so dark. 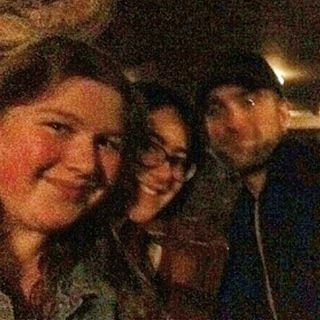 Also, Rob is kinda blurry coz he was very eager to leave as we'd literally stopped him as he was trying to get out the door!! But it was so sweet of him to take the pic with us." They also snapped a pic with FKA Twigs which you can see here.